In the highly competitive environment of ecommerce business these days, it is crucial to provide customers with extended services besides the products quality. If you don’t know how to use an advanced delivery schedule in Magento 2, you’ve come to the right place. 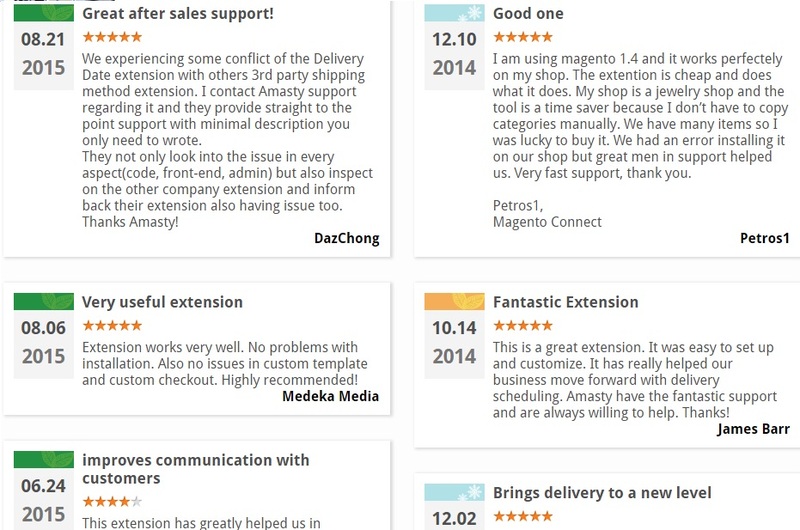 Below, we shed light on the Amasty Magento 2 Delivery Date extension. This module is designed to improve the default shopping experience of the popular ecommerce platform. As recent researches show, most customers are willing to purchase more from an online shop if it offers multiple delivery options. After you install the Magento delivery date extension, your customers will be able to choose the most convenient time for the delivery at the checkout. Furthermore, as a store owner, you will be able to specify the days when delivery is impossible. Thus, you will improve customer service on your ecommerce site and organize order management more efficiently. These and other features are discussed below. Min and max delivery intervals can be set. As you can see, Amasty’s Magento 2 delivery schedule extension is a reliable solution. Let’s explore its advantages in more detail. The tool provides highly customizable delivery intervals. It is possible to set both minimum and maximum delivery intervals that will be entirely suitable for your ecommerce needs. The Magento 2 delivery date extension even allows indicating by which time order should be placed for the same day delivery. Another important feature allows setting delivery slots hourly. You can manage them manually or leverage the automation the extension provides. Also, note that minimal delivery intervals can be applied on per product base. It is evident that some products can be delivered much faster, so the feature is brilliant. From the customer perspective, the delivery date can be changed after an order is placed. Thus, your buyers will always get the desired goods in time even if their plans have changed. Besides, there is a notification system that informs customers about the upcoming delivery. Go to Stores -> Settings -> Configuration -> Amasty Extensions -> Delivery Date to configure Magento 2 delivery date and time options. All main settings are divided into seven sections: General, Quota, Delivery Date, Delivery Date Edit, Delivery Time, Comments Field, and Reminder. 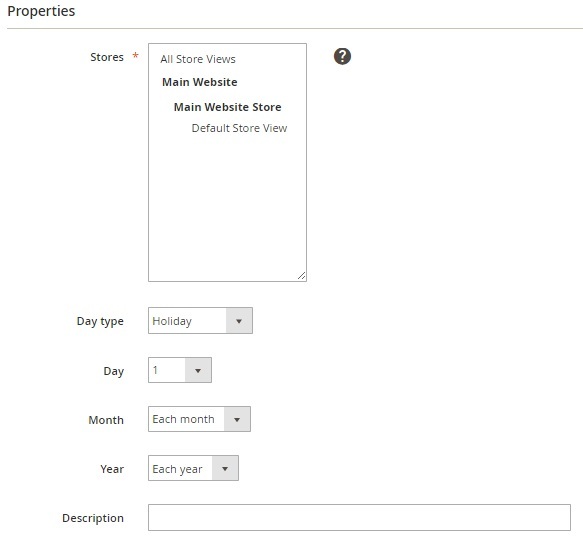 The first one allows you to enable/disable the Magento 2 estimated delivery date extension, set days when delivery is disabled, specify both minimal (and appropriate product attribute code) and maximal delivery intervals, configure same day and next day delivery, specify time offset, add a delivery comment and choose the style of the delivery comment, the notification sender, and the appropriate email template. In Quota, set the number of deliveries. It can be unlimited, or you can apply a daily limit. 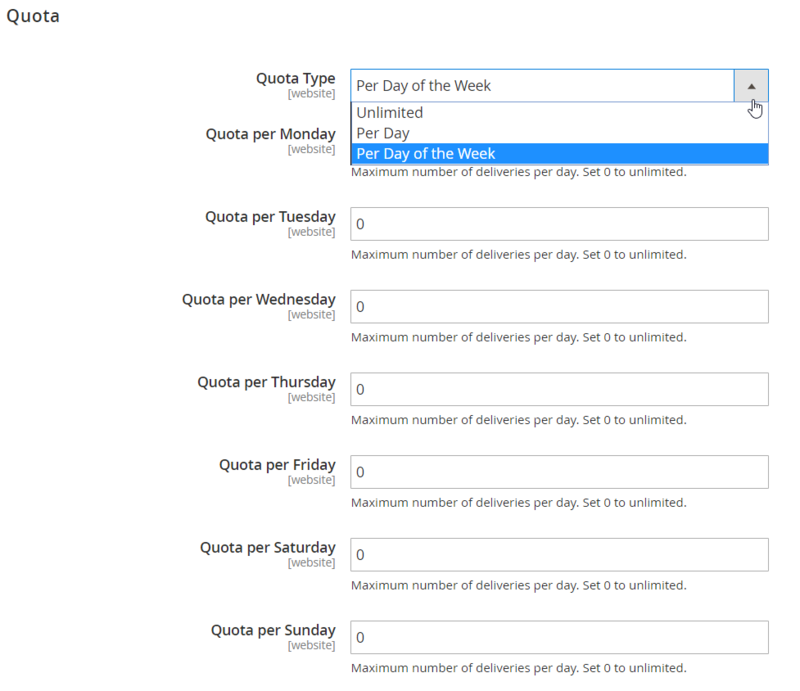 If choosing a weekly limit, specify the maximum amount for each day. 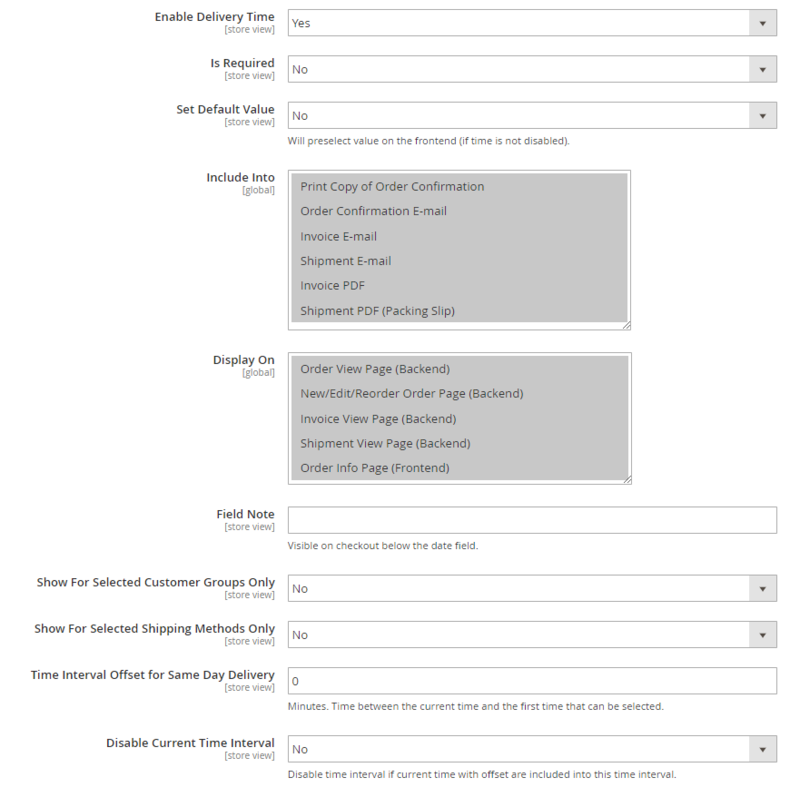 In Delivery Date, set the date format, specify whether it is required or not, decide whether to set a default value or not, choose where to include the corresponding information and on which pages to display it, type a field note and decide whether to show the delivery date option for selected customer groups and shipping methods only. 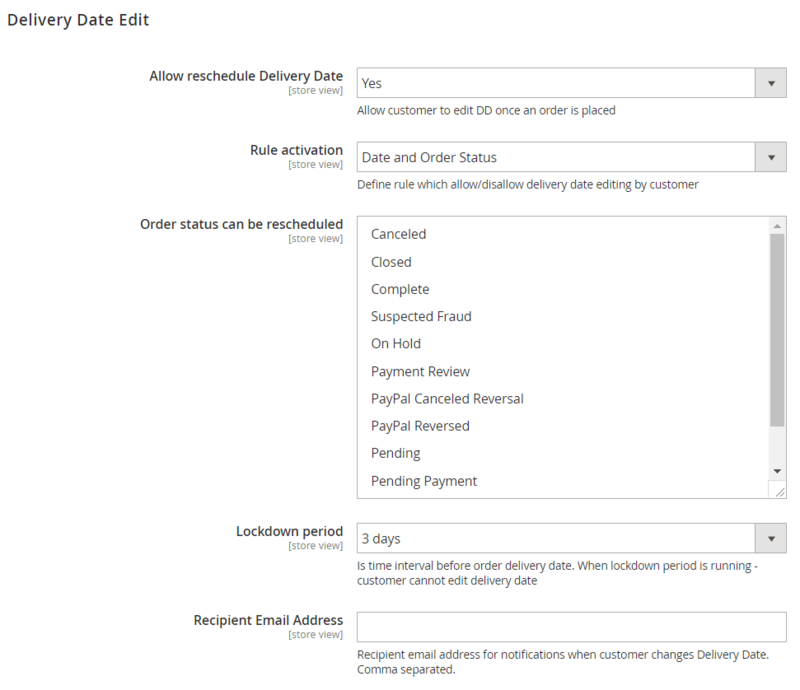 As for the Delivery Date Edit section, it provides the ability to enable rescheduling (customers can edit delivery date after the order is placed), define rule which allows editing delivery date by customers, select an order status that can be rescheduled, set time interval for editing delivery date, and type recipient email address to send notifications when a customer modifies a delivery date. 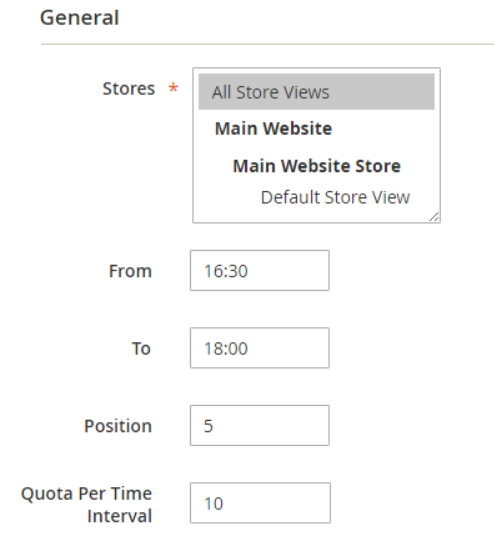 In the Delivery Time section of the Magento 2 delivery extension, enable/disable the appropriate feature, decide whether it is required or not, set a default value if necessary, specify where to include and display the corresponding data, add a field note, enable/disable the display on the basis of customer groups and payment methods, set a time interval offset for the same day delivery, and decide whether to disable current time interval or not. Similar options are available for the Comments Field section. 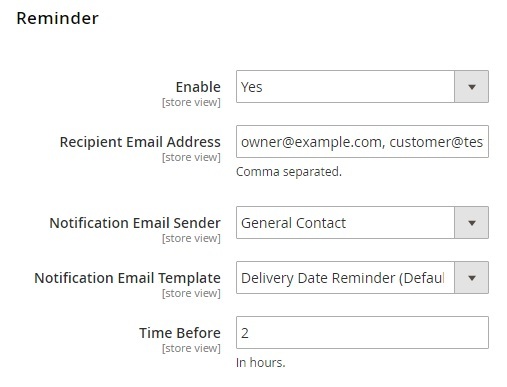 In Reminder, enable the feature, specify recipient email addresses, select a notification email sender, choose a template, and type in the time in hours for sending notifications. Next, go to Sales -> Delivery Date -> Exceptions: Working Days and Holidays. Here, you can view and manage all days when the delivery option is impossible. 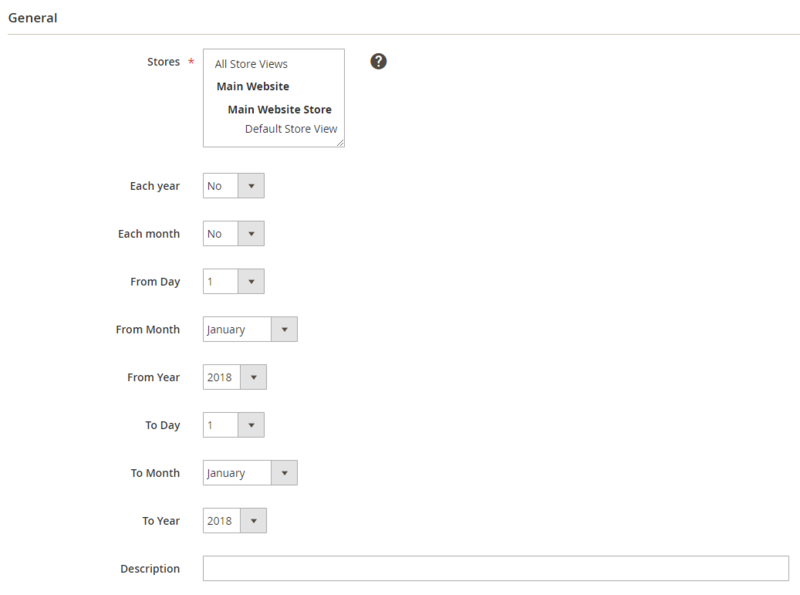 To add a new exception, select a store view, day type (holiday or working day), day, month (it can be each month), and year (each year is available as well). Then, type in a description. The same is about date intervals when the delivery is blocked. The Magento 2 delivery date extension offers the appropriate grid under Sales -> Delivery Date -> Exceptions: Date Intervals. To add a new interval, select a store view, decide whether this interval should be used each month or each year, and specify time frames. In the last field, leave a description. The Delivery Date Magento 2 extension also allows admins to create and manage time slots to offer customers the selection of delivery intervals. 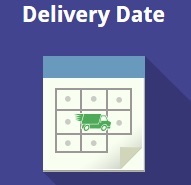 The relevant grid is located under Sales -> Delivery Date -> Time Intervals. 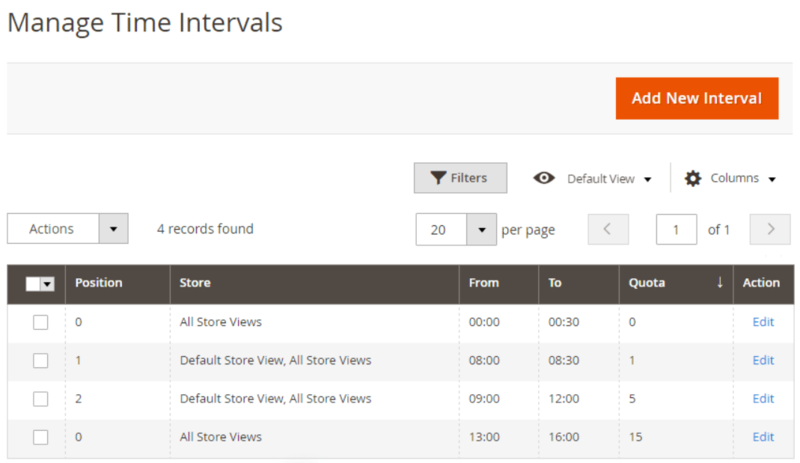 When creating a new interval or editing an existing one, choose a store view, set the start and end dates of the interval, and specify its position and number of deliveries (quota) per interval. The Amasty Delivery Date Magento 2 module provides a comprehensive backend interface, where you can configure all possible parameters related to Magento 2 delivery date and time. So, what about the appropriate frontend functionality? 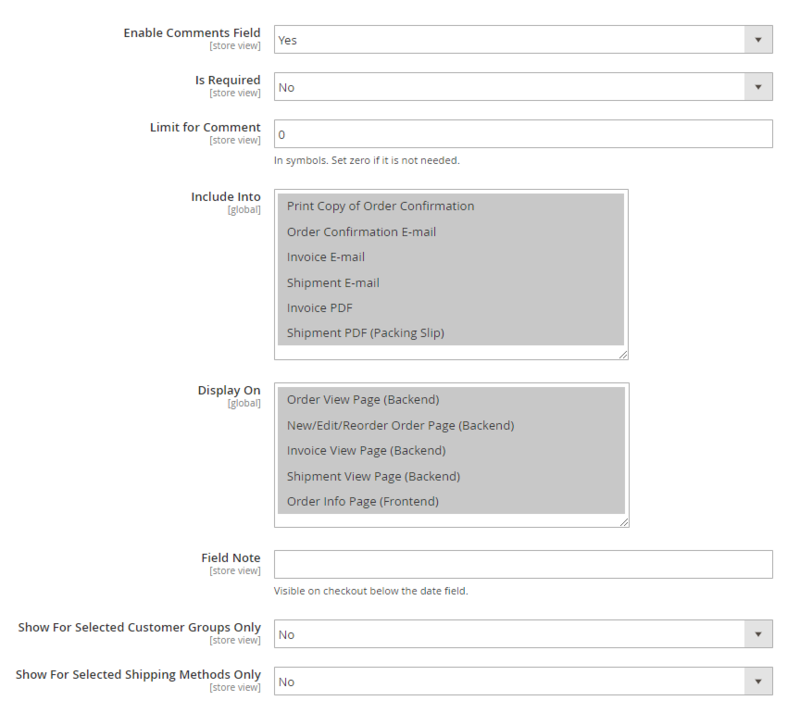 After placing the order, a user will be able to change the specified delivery options in the customer account (if the corresponding option is activated in the backend). New functionality for the Delivery Time option was implemented: time intervals for the time that has already passed are not displayed on the frontend. Now you can set default values for Delivery Date fields in the extension settings. 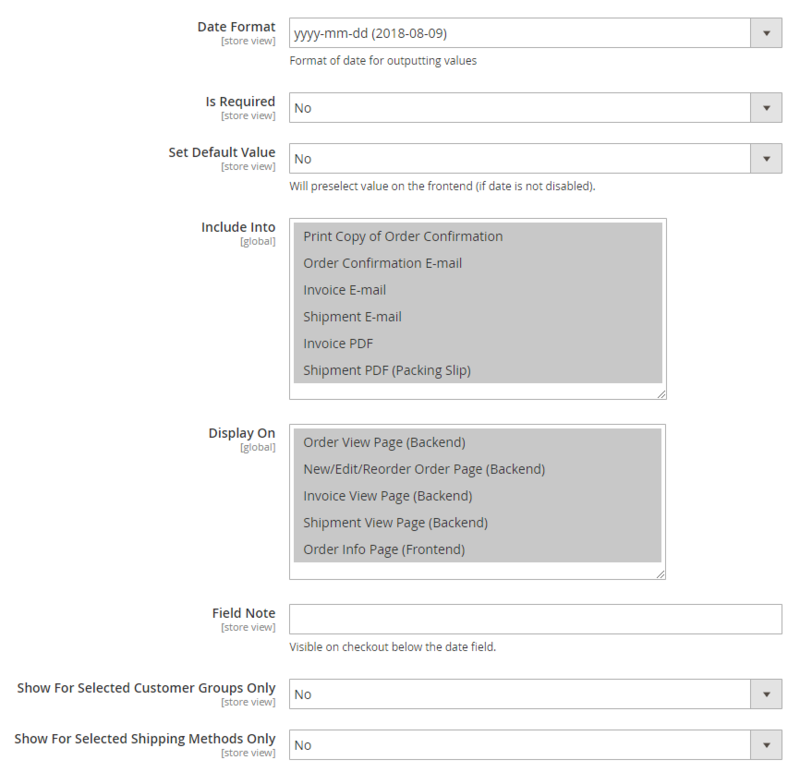 Now validation of the Delivery Date fields is possible for orders placed in the admin area. Possibility to use translations for the calendar was implemented. The functionality that allows customers (both signed in and guests) to change the delivery date of the order was added. A possibility to set up rules that define for which orders the editing is possible (rules based on date and/or order status) was added. 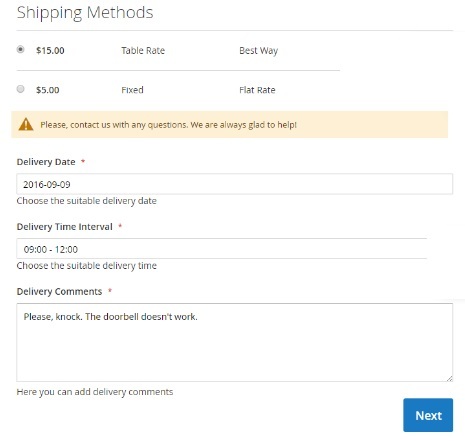 A new feature to set a specific minimal delivery interval (which overrides the general rule) for the desired scope of products. 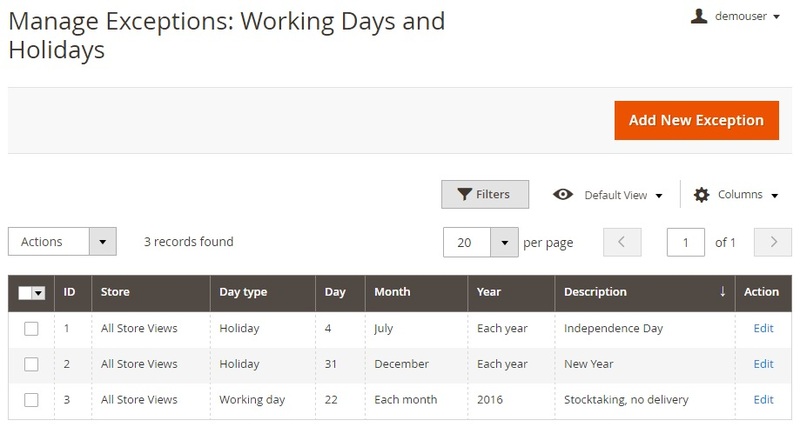 A new feature to specify the exact working days as exceptions to delivery dates. The Amasty Delivery Date Magento extension offers missing features that substantially improve the default user experience of the platform. No more additional calls are needed since your customers leave all the necessary information during the checkout procedure. The module improves usability, reduces abandonment score, and provides your customers with a few more reasons to love your online storefront. Amasty Delivery Date for Magento 1 costs $89, while the Magento 2 module’s price is $179 with three months of free support included in both M1 and M2 versions.